The sun sets with the Bell Mountain chairlift in the foreground of Aspen Mountain, as seen from a seat in the Silver Queen Gondola. Aspen Mountain’s winter season is hanging in the balance while officials search for a chair that was taken from the Bell Mountain lift last week. The 33-year-old lift cannot run without all of its chairs on the line because of its design and mechanics. And even though it doesn’t run often, the Bell chair is a crucial link to access the mountain when it is a low-snow year, or there are issues with the Silver Queen Gondola, Aspen Skiing Co. spokesman Jeff Hanle said Wednesday. He said that the past two ski-season openingsrelied on the Little Nell and Bell Mountain connection. 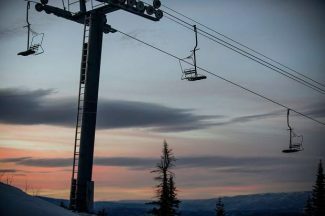 “Although we had top-to-bottom skiing, we ran Bell for the first 25 days or so of last season because the best skiing was the man-made surface and that allowed guests to lap that area,” Hanle said via email. So Skico is asking the individuals who took the chair sometime last week to bring it back — no questions asked. Hanle said Skico officials considered giving a reward but decided to rely on good, old-fashioned honesty. A lift maintenance worker noticed the chair gone after a couple of days of it sitting near the upper terminal on top of Bell Mountain. It had been removed from the line so a work chair could be installed for routine maintenance on the lift. Hanle said the maintenance worker noticed it was gone Aug. 29 and it had been offline for only a couple of days. If anyone saw a truck or any vehicle in the vicinity of Bell Mountain last week, or have other information regarding the missing chair, they are asked to call 970-920-0751. Skico reported the theft on Friday, according to the Pitkin County Sheriff’s Office. The report, written by deputy Michael Buglione, states that Skico had no suspects and there are no cameras in the area. Weldon told authorities that he was going to use Skico’s social media outlets to get the word out that the company wants its chair back, according to the report. Hanle said Skico is in communication with the manufacturer, the Riblet Tramway Co., which produced the Poma double chair. But Hanle said it would be extremely expensive to find another one, and then remove the remaining 224 chairs, reset their timing and put a replacement on the line, if it’s even possible. “That’s why we are subtly nudging the community to bring it back,” he said.